・NEW! High-resolution color images clearly depict the diagnostic features of hundreds of conditions. ・NEW! 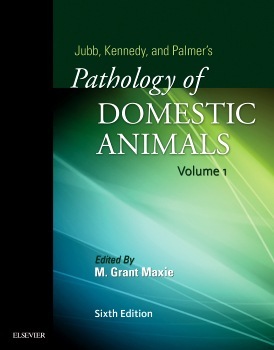 Introduction to the Diagnostic Process chapter illustrates the whole animal perspective and details the approaches to systemic, multi-system, and polymicrobial disease. ・NEW! Coverage of camelids is now included in the reference’s widened scope of species. ・NEW! Team of 30+ expert contributors offers the latest perspective on the continuum of issues in veterinary pathology. ・NEW! Expanded resources on the companion website include a variety of helpful tools such as full reference lists with entries linked to abstracts in Pub Med and bonus web-only figures. ・NEW! Full-color design improves the accessibility of the text. ・Updated content includes new and evolving pathogens and diagnostic techniques. ・Updated bibliographies give readers new entry points into the rapidly expanding literature on each subject.